Calling all Buckeyes! What’s round on the end and high in the middle? O-HI-O!!! The OSU Alumni Club of DFW is excited to host the tailgate party of the season! 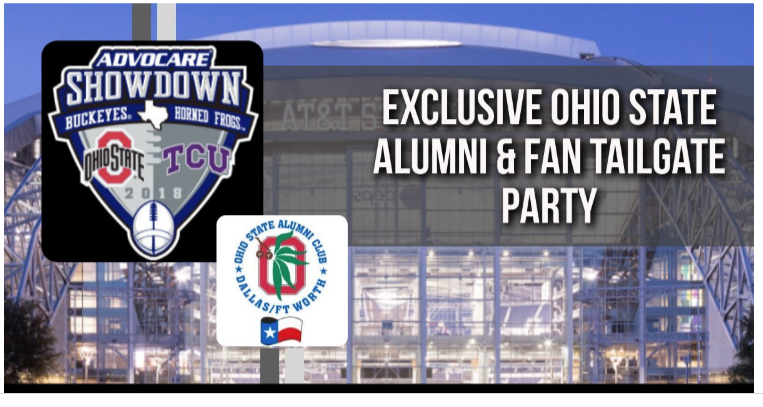 We booked the closest venue to ATT stadium (900 feet away from gate A) with drinks flowing, BBQ and live DJ jamming, Zeke’s signed OSU football and other former & current players’ signed memorabilia drawing give aways for our Alumni guest to enjoy. All ages are welcome, kids 13 and under enter for free with guardian presence. One ticket per guest includes 6 drink tickets (beer or margaritas), BBQ Buffett (one trip to the Buffett line, per guest), live DJ and access to restricted tailgating area for OSU Alumni. Tailgate Tavern doors open at 11am on Saturday 9/15/2018. There is a bus service available for those who would like to travel to and from the event with their fellow Buckeyes. *For Ohio State Alumni staying at the Omni Hotel in downtown Fort Worth, there has been a separate shuttle service set up to take you to the event.